University of Houston faculty reacts to Texas campus carry gun law. 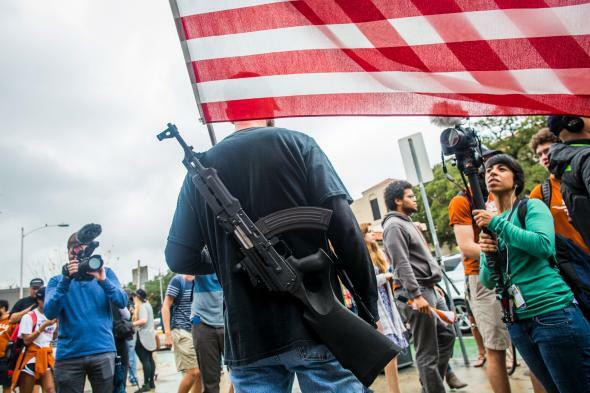 Gun activists march close to the University of Texas campus Dec. 12, 2015, in Austin, Texas. The Republican-run Texas state legislature voted last year to allow students to carry concealed handguns into classrooms, dorms, just about anywhere on campus. If that seems like a bad idea to you, imagine how you’d feel if you were a professor. There’s nothing quite like the free exchange of ideas in an armed art history 301 seminar. The academic chilling effect seems pretty obvious for students and faculty. The law is set to go into effect on Aug. 1, and public universities in the state are currently grappling with how to implement the measure, which gives some flexibility to the institution. For example, the Univ. of Texas at Austin will not allow guns in dorms but will allow them in classrooms. Logistically speaking, that means students living on campus would have to, presumably, walk to their car to grab their gun before class. Or bury it in the quad? Employing either option makes you the worst and a bit of lunatic. The University of Houston is in the process of drafting its policy on concealed carry on campus.